Avadh Sugar & Energy Ltd is in portfolio of Anil Kumar Goel. He is one of the top investors in India. The company belongs to Sugar sector. This company is also known as Birla Sugar. The Company having four sugar mill at Hargaon (District Sitapur, Uttar Pradesh), Seohara (District Bijnor, Uttar Pradesh), New India Sugar Mills, Hata (District Kushinagar, Uttar Pradesh), Rosa Sugar Works at Rosa (District Shahajahanpur, Uttar Pradesh) with a combined crushing capacity of 31,200 TCD. It is also having two distilleries at Hargaon and at Seohara with a total capacity of 200 KLPD. It is also having Cogen facility and can produce 74 MW power. The stock is recent listing on stock exchanges. It got listed in year 2017 at listing price of 440. This was not ideal time to get listed. Soon after listing there was sell off in market impacting the Company as well. Such an short chart is not meaningful. It does not provide enough information about the Company performance. IPO investors are not in loss but have not made any real money as well. 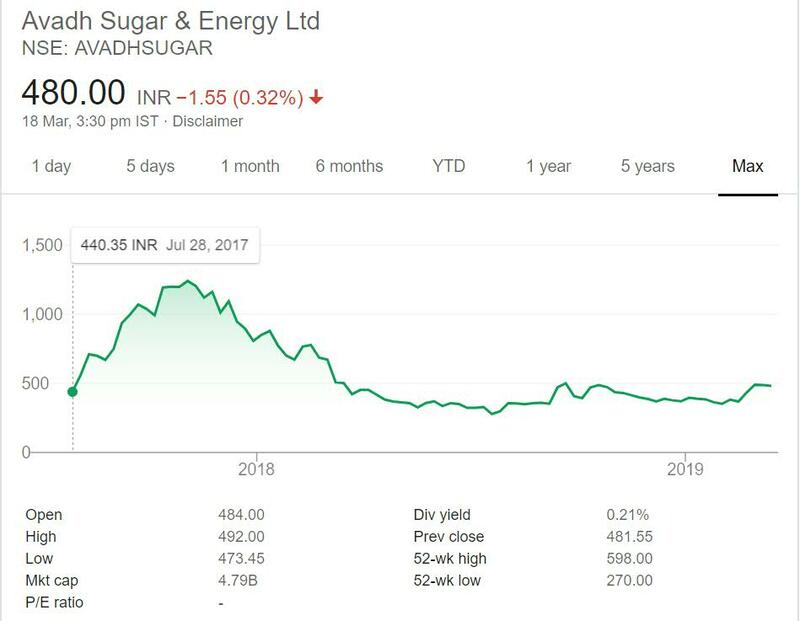 Avadh Sugar & Energy Ltd is a Sugar Company. Along with Sugar it has focus on other by products as part of Sugar creation process like Renewable energy and Ethanol. Note Government of India has mandated mixing of Ethanol with Petroleum which will boost the sector. The Company is newly listed and not much information is present about it. With KK Birla group in charge management is good. Note this is one of many Sugar Companies in portfolio of Anil Kumar Goel. Sugar is cyclic sector. You should keep a track on this Company and others before making a decision. The entry and exit points are very important for cyclic sectors. Note most of the Companies will have upward journey and downward journey together. But some will move up fast and some will move down fast.